Shrubby cinquefoil ‘Goldfinger’ is a flowering, deciduous hedging plant. However, it is not typically used for screening hedges due to its 1.2m maximum mature height. Potentilla ‘Goldfinger’ is commonly grown as a low, informal hedge in a border, park or shrubbery. 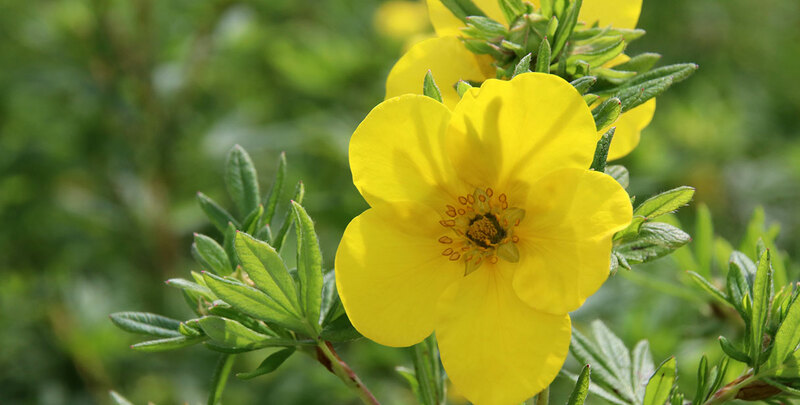 A resilient and tough plant, shrubby cinquefoil ‘Goldfinger’ can grow in a wide variety of soils, including sand and lime, but it will not tolerate waterlogging for an extended period of time. In addition to being undemanding with regard to the soil it is planted in, shrubby cinquefoil ‘Goldfinger’ is a very hardy, frost-resistant shrub which can also deal with drought or dry periods. Pruning, trimming and watering are completely unnecessary, unless you prefer to keep this bushy shrub a bit more tidy, in which case it can be pruned once a year to keep it in perfect shape. Shrubby cinquefoil ‘Goldfinger’ has an average annual growth rate of 10-15cm. All things considered, potentilla ‘Goldfinger’ is a very convenient option if you’re looking to add some summer and autumn interest to your garden. This certainly explains why potentilla can be found in gardens and parks all around the UK.